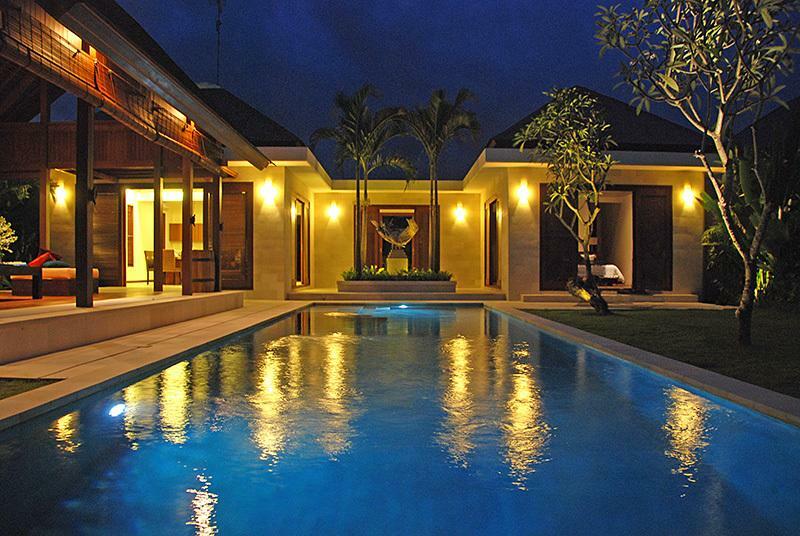 The villa complex embraces seclusion, relaxation and comfort within a tranquil setting. 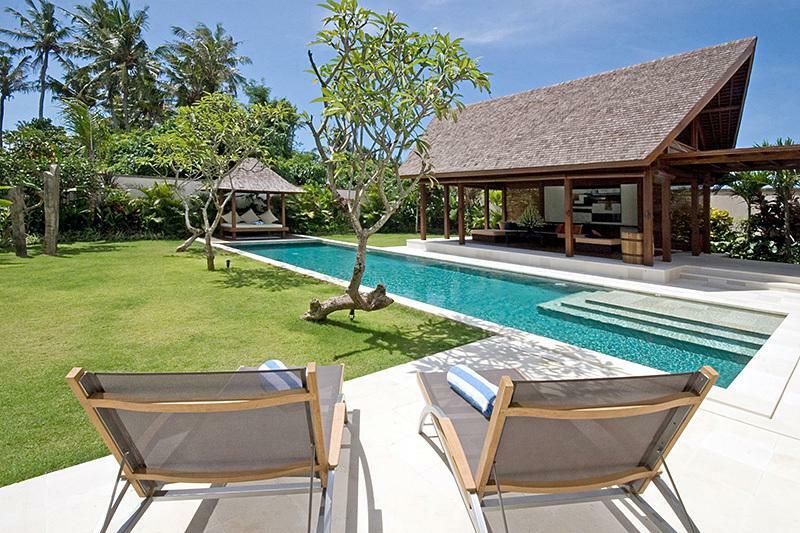 Surrounded by terraced rice paddies near Berawa Beach on Bali’s south-west coast, it is less than 10 minutes from the heart of Seminyak. 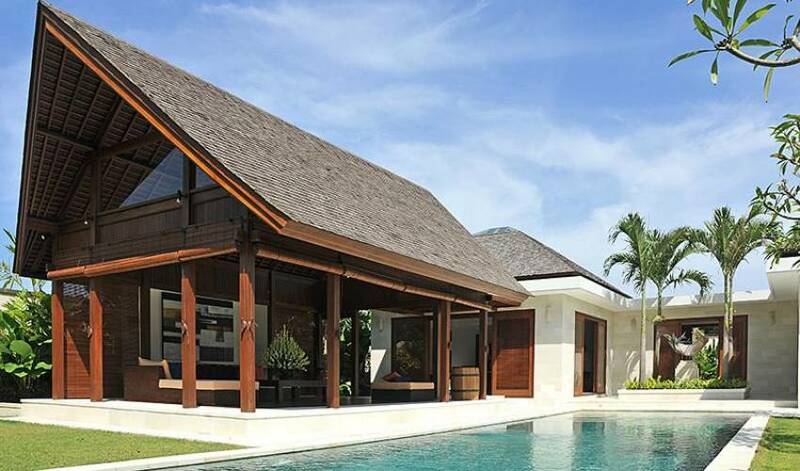 This exclusive enclave comprises five independent, but inter-connectable one- and two-bedroom private villas, providing a total of nine large bedrooms, garden bathrooms, open-sided living and dining pavilions, well-equipped kitchens, swimming pools, lush tropical gardens and unique local artwork. All villas are fully staffed and include a professional chef and two cooks, who create delicious dishes from a central staff kitchen. 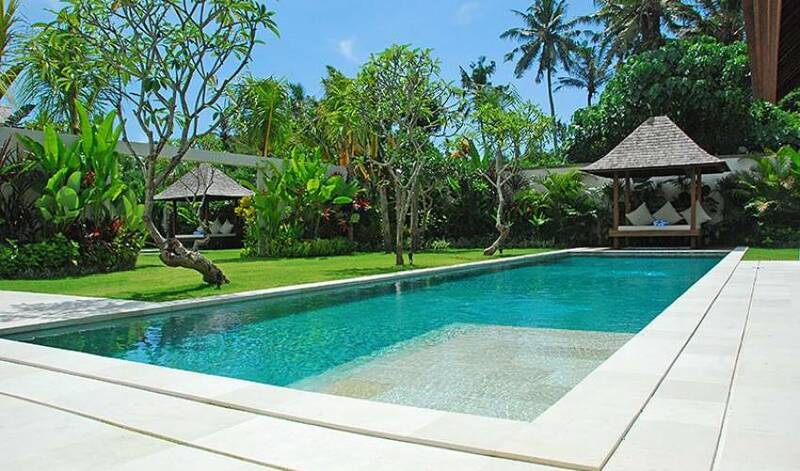 Guests also have full, complimentary access to the nearby Canggu Club. 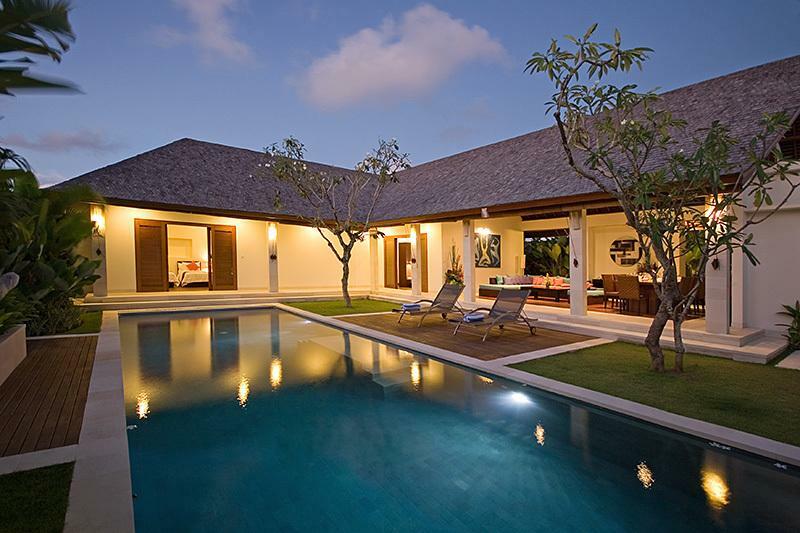 The beauty of the villa is its adaptability: it can be anything you want it to be, from a romantic honeymoon destination to a sprawling holiday retreat for several families, where the children can run freely between the villas without a care in the world. 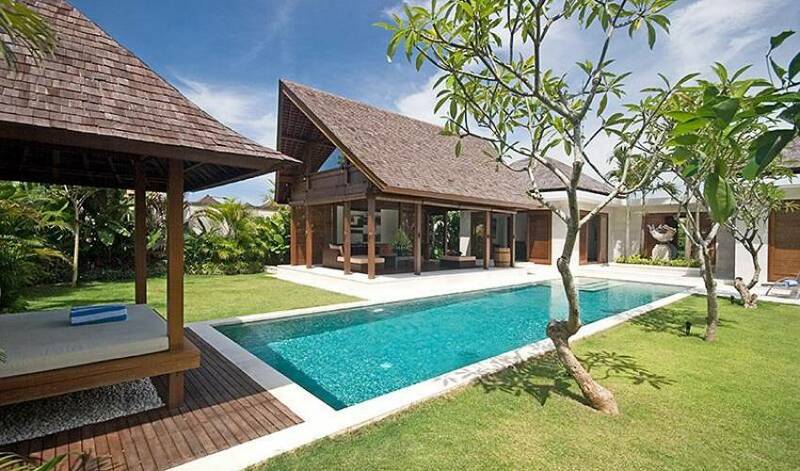 With garden wall panels that slide open at just a moment’s notice, the villa complex is perfect for a romancing couple, a party of six or a troupe of eighteen; the choice is yours. 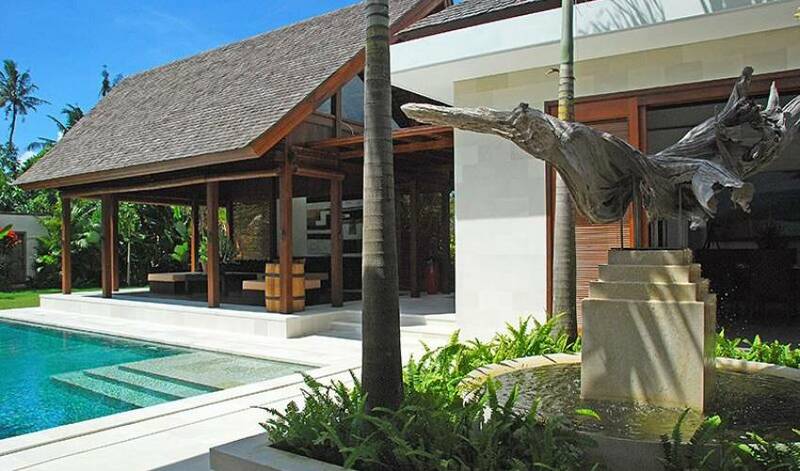 This contemporary complex of five villas features large bedrooms, tropical ensuite bathrooms, open-air living and dining pavilions (air-conditioned dining rooms in the two master villas), fully equipped kitchens, swimming pools, and lushly planted gardens. WiFi internet is available throughout and all living areas are fitted with iPod speakers – an iPod loaded with music to suit all tastes is available on request. On-demand movies and satellite channels can be viewed on TV screens in all the bedrooms. Butlers are on hand 24 hours a day to cater to their guests’ every need, and a team of three private chefs prepare restaurant-quality food at very reasonable prices. Professional security guards provide a round-the-clock service. 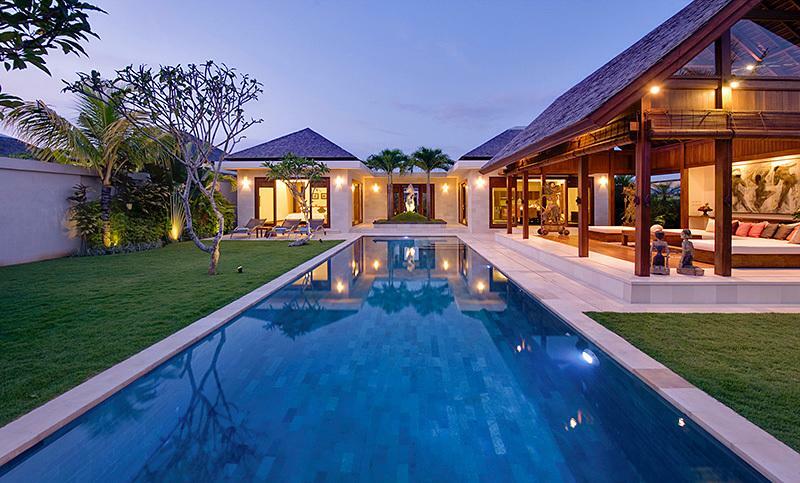 Seminyak – Bali’s premier location for wining, dining and shopping – is only ten minute’s drive from the villa, made even more accessible courtesy of the villas’ twice-daily shuttle service. Canggu’s world-famous surf beaches are within walking distance, and many new cafes and restaurants are springing up in the neighbourhood, just waiting to be explored. 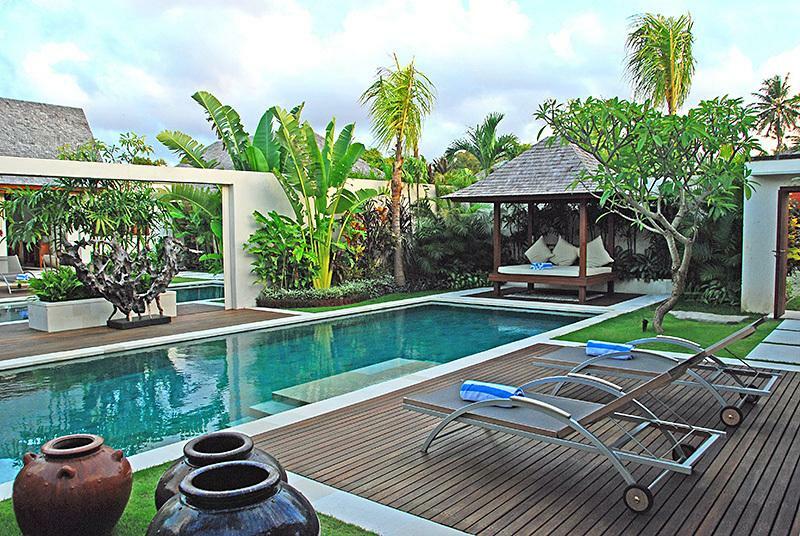 The sports and leisure facilities at Bali’s exclusive Canggu Club are also available to guests during their stay. 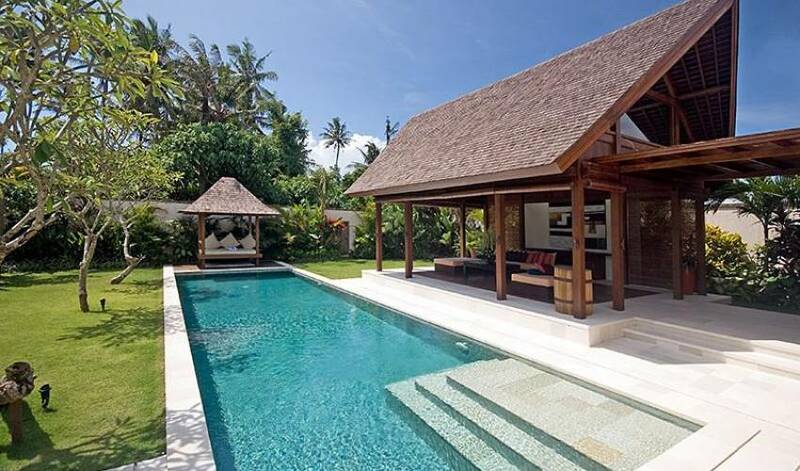 Whatever your holiday dreams, whether it is a getaway for two or precious time with friends and family, they will surely be realised at the villa complex. As well as its two spacious ensuite bedrooms, Villa 3175 features a large air-conditioned dining room and integrated, well-equipped, modern kitchen. Connected to the dining room via a covered walkway is the beautiful, open-sided living pavilion. 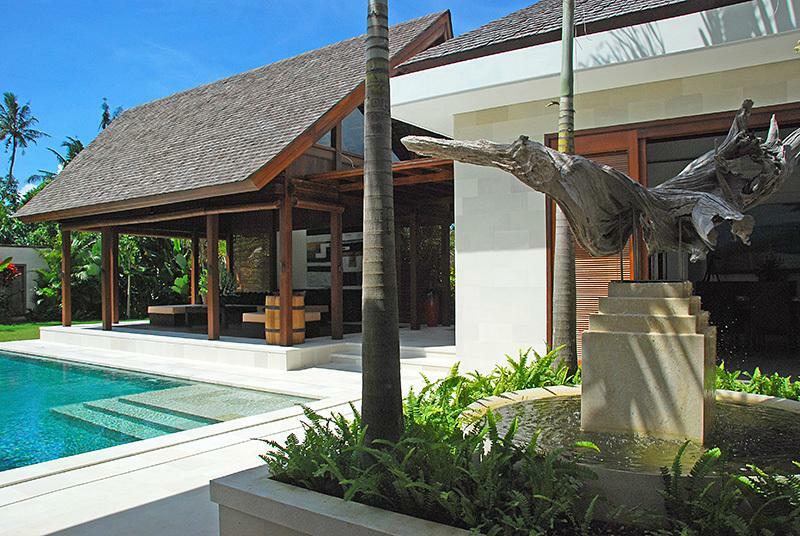 The living pavilion is positioned beside the 15-metre pool set within the well-tended tropical gardens. At the far end of the pool is a shady, comfortable bale. 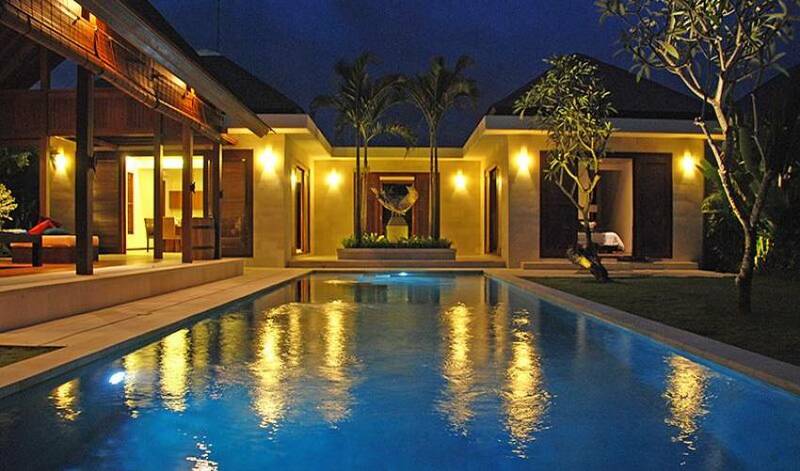 A large, sliding wall panel separates this villa from the other master villa, Villa 3478. 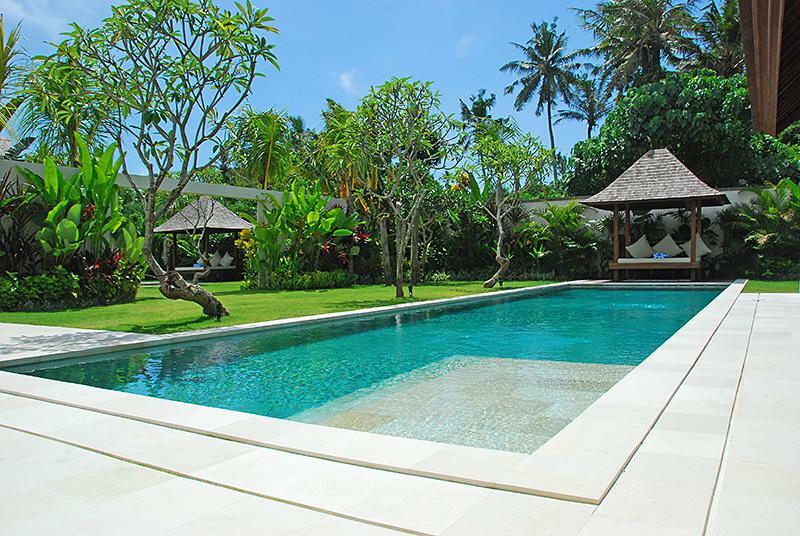 Guests who book both villas can request the staff to open the wall panel to provide a huge garden area with the two swimming pools – ideal for family groups requiring four bedrooms and plenty of space for the children to have fun. This open set-up also lends itself to weddings and birthday parties. 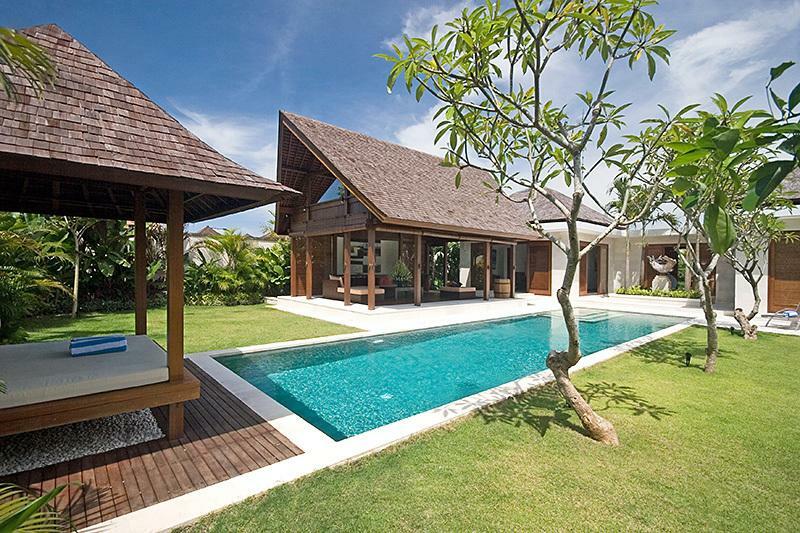 Villa 3175’s living area overlooks a flourishing tropical garden offering guests a true taste of tropical Bali living. 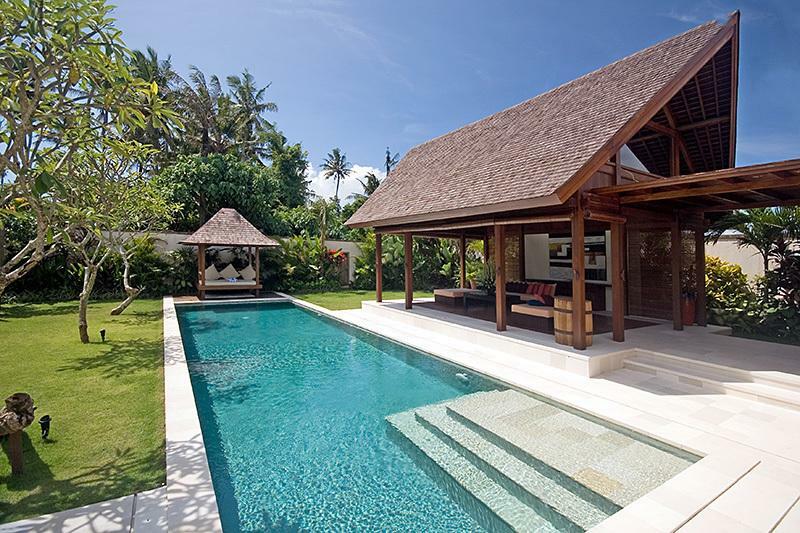 Unwind poolside on the loungers or relax on the deeply cushioned sofa, which can comfortably seat ten guests, below the pavilion’s soaring traditionally crafted roof. Living areas are fitted with iPod speakers, and an iPod loaded with music to suit all tastes is available on request, making this the ideal spot to catch up with friends, read a book or enjoy cocktails and canapés at sunset. From the living pavilion, a covered walkway connects to the villa’s air-conditioned dining room, with seating for eight, and integrated fully equipped kitchen. Villa 3175’s master bedroom, furnished with a king-size bed and writing desk, has double doors opening onto the garden, ensuring that it is wonderfully light and airy. The second bedroom, which overlooks a neat courtyard, has twin beds which can also be made up as a kings. Both rooms are equipped with TV screens and the master bedroom with a hard drive media player (pre-loaded with a huge collection of movies and TV series). Large open-air ensuite bathrooms feature tubs and rain showers. 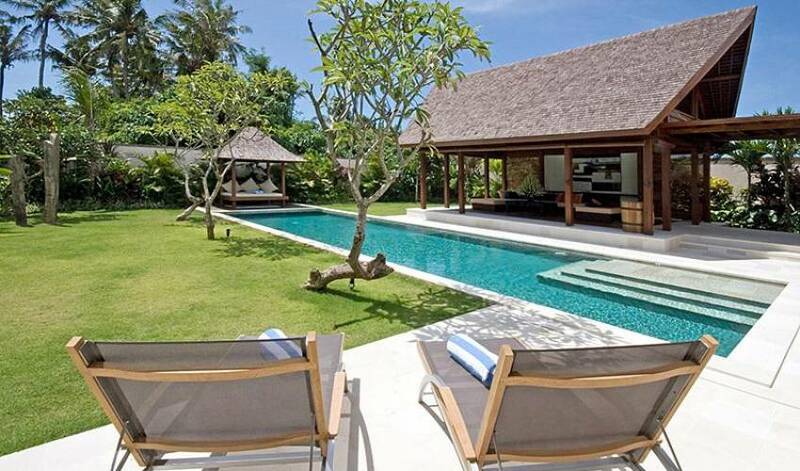 The villa complex is located near Berawa Beach, between Seminyak and Canggu, on Bali’s south-western coast, just 30-40 minutes from the international airport.